I was unpacking a box from my classroom last week, full of framed pictures and awards from my previous life as a classroom teacher of history and the Holocaust. Yes, I know it is February, and I ‘retired’ in June. I guess that it’s taking so long because some days I wrestle with the fact that I’m no longer in the classroom with the kids everyday. But I can tell you that students and teachers have been on my mind all week long, given the events in a Florida high school. So I’m unpacking this box (and subliminally wondering why I am even bothering to unpack the box, now eight months down the line), dusting off the frames but noticing a few small yellow spots that don’t go away with a wipe, but can be scraped away with a fingernail. I’m curious, and then it all comes flooding back. Oh yeah. It was from that day a few years ago when an enraged 18-year-old in my classroom (whom I had been walking on eggshells around all year long) suddenly sprang out of his seat like a coiled spring and hurled his books at me from across the room, narrowly missing me, and, rapid reload, fired his 20-ounce sticky breakfast energy drink which exploded at the horizon line above my head where the yellow painted cinderblock wall and ceiling met, spattering and raining sticky golden gunk everywhere. He turned and it seemed like he nearly tore the metal classroom door out of its frame, opening it with such a velocity that it ricocheted off the closet, and stormed out of the room and down the hall. I instinctively walked quickly to the door, closed it, and locked it. My stunned students were quiet as I returned to my desk and called the office. And then I somehow managed to carry on with the lesson, until I could follow up the next period. Must keep things ‘normal’. But I was shaking. All I had done was ask him nicely, respectfully, and personally, three times, to stop texting during the lesson. I was gentle, quiet. I even said please. I don’t think the other kids even heard me, hence their stunned incredulity at the explosive reaction of the student. Later I insisted that he not be allowed in the vicinity of my classroom, and maybe I was lucky that my wish was granted. I’m sure I was lucky on many levels. I never saw him again. All of this brought back what I have been thinking about all week. It was not my first brush with some level of threatening or violent behavior in the classroom. We, kids and their teachers, administrators, deal with this enough so that the ‘what ifs’ are always present, but now they are again hurtling from the back to the forefront of our lives. And so to my teacher friends, some of whom, hearts heavy, cried in front of their students this past week, it’s okay. You’re bombarded and pounded-again-but your kids know that you are there to listen to them. So that’s just where it is right now. You are there for them, and frankly, in this moment, they are there for you, too. Now I circle back to that question-was there every really a time when I would not have put it on the line for my kids? Not at all. And truth be told now, I always balanced a 3-foot-long piece of angle iron (left over from school construction) on my knees, when seated just behind the door, while the kids were huddled in the corner during the shooter drills. (Maybe it wouldn’t do any good, but it sure felt comforting to hold on to a heavy piece of metal.) And after a week of fumbling to find the right words, I read this article in the NY Times. Yes. Times like these I really miss my school family, and the beautiful human beings we nurture and cultivate. And kudos to Bruce Klasner, fellow Holocaust and Jewish Resistance Teachers’ Program alumnus. I don’t know Bruce, but he nailed it for me. 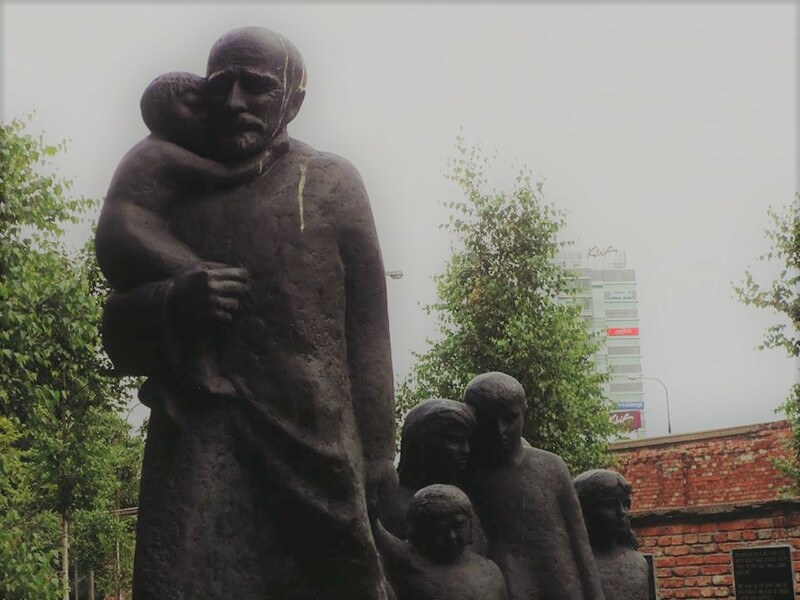 Janusz Korczak memorial, Warsaw, Poland. I took this while on myHolocaust and Jewish Resistance Teachers’ Program journey. Look him up sometime. And read below. TAMARAC, Fla. — The shooting was all over, but the emotional reckoning had just begun, and so on Saturday the teachers of Broward County packed their union hall to discuss what it meant to have become the nation’s human shields. “Last night I told my wife I would take a bullet for the kids,” said Robert Parish, a teacher at an elementary school just miles from Marjory Stoneman Douglas High, where a former student killed 17 people, including three staff members who found themselves in the line of fire. Across the country, teachers are grappling with how their roles have expanded, from educator and counselor to bodyguard and protector. They wonder if their classrooms are properly equipped, if they would recognize the signs of a dangerous student, and most of all, if they are prepared to jump in front of a bullet. In the last few days, teachers wrote to Congress, urging bans on assault weapons, and to state lawmakers, seeking permission to carry firearms to school. They attended local protests and reviewed safety plans with students. And in the evenings, they spoke with friends and family about an excruciating reality — that teachers, who once seemed mostly removed from the life-or-death risks faced by the ranks of police officers and firefighters, might now be vulnerable. Many teachers said even contemplating such worries felt far from what they had once imagined their challenges would be. As if the mounting pressures of test scores and email messages to parents and bus duty and hall duty and new certifications and all those meetings wasn’t enough. But the death toll has piled up — staff killed in shootings at Columbine High School in Colorado in 1999, Sandy Hook Elementary in 2012 and now at Stoneman Douglas in Florida — and is forcing a shift in how teachers view their responsibilities. “When I started teaching, I thought I was just coming in to teach,” said José Luis Vilson, 36, a middle school math teacher in New York City. Now he has come to view himself as a first responder, too, and added that instruction on topics such as conflict resolution and first aid would be useful. Bo Greene, 56, a calculus and statistics teacher in Bar Harbor, Me., said the planning for dangerous situations had increased and grown more specific in the last year, even in her quiet school district. All of it feels jarring after decades in education, she added. Laurel Holland, who was Mr. Cruz’s 11th-grade English teacher, said teachers in big public schools cannot possibly be expected to look into every student’s background to know if they have long been troubled. The year that she taught Mr. Cruz, she had more than 150 students, she said. Ms. Holland eventually reported him to the administration, and he was removed from her class after one semester. Inside the crowded union building on Saturday, educators held hands and shouted “Union strong!” before getting down to business. How, they asked, were they going to stop the next one? For hours they spoke of the golf clubs and baseball bats they would like to keep in their classrooms, of the bulletproof vests they wish they had, of the challenges of removing mass killers from their midst. Here in Tamarac, the union meeting was wrapping up. Jim Gard, in cargo pants and a union polo, stood outside, amid palm trees. At 58, he has been a teacher for 36 years, he said, and works at Stoneman Douglas. When the shooting broke out, he was in math class, not far from where many were shot. He had taught Mr. Cruz, as well as two of the dead. “You know, if I go through my college transcripts — master’s degree, doctorate courses, all that — I know for sure there are no courses that say: ‘Shooter on Campus 101,’” he said. The Broward County school district announced on Monday that staff members would return to Stoneman Douglas at the end of the week. Classes are expected to resume on Tuesday, Feb. 27. Mr. Gard said many of his colleagues were struggling with the idea of returning. You always make me think, Matt. A very good thing.